The play opens in the afternoon, on the Avenue de l'Opera in Paris, where a young girl named Christine Daaé is selling songs on the street. She has a new song, called "Melodie de Paris," that she is singing while handing out the sheet music. She is approached by the Count Philip de Chandon, who tells her that her voice is beautiful and could be suited to the opera with the proper training. He is a powerful patron of the opera, and hands Christine his card, telling her to show it to Gerard Carriere, who is the manager of the Opera House. He says that Carriere will arrange for her to have singing lessons. Christine can't believe her incredible fortune. Singing in the opera would be like a dream come true! Meanwhile at the Opera House, the opera's resident diva Carlotta has ordered her costume man, Joseph Buquet, to go down into the opera's basement. She and her husband are about to take over the opera and she wants an inventory of whatever's down there. The stage hands have told Buquet he shouldn't go down there, and he is terrified, but she insists. He goes down the stairs, but the Phantom appears. The Phantom is not wearing a mask, and Buquet screams in fear. The Phantom slits Buquet's throat and kills him. The Opera company is preparing for the evening with excitement when the news comes that Gerard Carriere has been fired as the opera manager. His replacement is Carlotta's husband, Alain Cholet. It's rumored that Cholet bribed the Minister of Culture to get the position. While Cholet is addressing the opera company, with Carlotta at his side, a letter comes fluttering down from above, striking panic in the troupe members. Cholet demands an explanation from Carriere. Carriere explains that the opera is haunted by a ghost who lives in the basement of the opera. No one is allowed to go down there, and anyone who has dared to break that rule has never been seen again. The ghost is called the "Phantom" of the opera, and he must be obeyed for fear of dire consequences. Cholet does not believe in ghosts, and is convinced that Carriere is simply trying to take revenge because he's been fired. Carriere visits the Phantom in the basement, and it becomes obvious that they know one another. The Phantom tells Carriere that he killed Joseph Buquet because he saw his face, and he demands to know how Carriere could let something that happen, as it's been Carriere's job to prevent anyone from entering the Phantom's domain. Carriere tells the Phantom that he's been replaced as opera manager. Worse, Carlotta's voice comes floating through the air, and the Phantom learns that as the new prima donna of the opera, Carlotta is in charge of the opera season and can sing in any part she wants. The Phantom cannot bear it; without Carriere's help, and with Carlotta's voice torturing him all the time, his life is bound to get worse than it's ever been. He sends some of his 'ghosts,' or phantoms, to generally annoy Carlotta and wreak havoc for her. When Carriere leaves, the Phantom mourns, longing for someone with a beautiful voice to come and fill his life with light and music again. He needs that beauty to exist. Christine appears at the Opera House door, looking for Carriere on the Count de Chandon's recommendation. When she finds out that Carriere has been fired, she despairs, but the kindly doorman, Jean-Claude, tries to cheer her up. He suggests that perhaps the new manager will help her, and takes her off to introduce her to Cholet. Carlotta, in her suite, is approached by some of the opera staff who are trying to show her what they have planned for the new season. Carlotta is offended and kicks them all out, then parades through her suite and the backstage area proclaiming that the entire opera belongs to her. Jean-Claude brings Christine backstage and introduces her to Cholet, who isn't very interested until Jean-Claude points out that the Count de Chandon (the opera's leading patron) is Christine's benefactor. Cholet introduces Christine to Carlotta. Carlotta also brushes her off at first, and suddenly develops a keen interest when she hears who is sponsoring Christine. She decides that Christine should become her new costume girl, since Joseph Buquet mysteriously disappeared, insisting that the first step in learning to sing is to watch singers. Jean-Claude is disappointed, as this isn't at all what he or the Count had in mind, but Christine is delighted just to be able to work in the opera. Setting to her work right away, Christine feels like she's finally come home. She sings sweetly and happily as she goes about cleaning and mending Carlotta's costumes. From below, the Phantom hears her angelic voice, the voice he's been dreaming of, the voice that he's been waiting for his entire life. He can scarcely believe it. He dares to approach Christine, keeping in the shadows, and tells her not to be afraid of him. She has a beautiful voice, but it needs training to be fit for the opera, and he would like to train her. He tells her he will need to wear a mask, though, to hide his identity, as he is a singer of some repute himself and others might want lessons to were the word to get out that he is training someone. Christine is amazed, and a little confused, but it seems like a golden opportunity and she accepts. 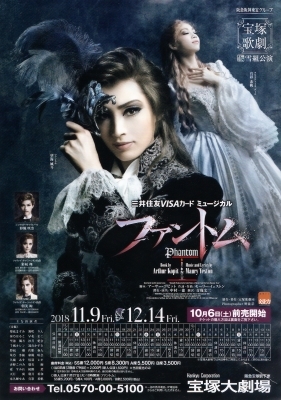 The Phantom sets out to destroy Carlotta, at the same time that he is training Christine. He appears at rehearsal one day and causes general chaos, concentrating particular humiliation on Carlotta, whom he can't stand. The body of Joseph Buquet is discovered, striking fear in the hearts of the opera company. There are some officers at the opera who begin a hunt for the Phantom, but he is impossible to find. Christine makes rapid progress, thanks to the Phantom's lessons, and he decides that she is ready for a real test of her skill. She can't do an ordinary audition, as Carlotta would never allow it, but the Count de Chandon is throwing a big party at the local bistro, and there will be a singing contest. By this time, the Phantom is deeply in love with Christine, and with her beautiful voice. "You are music," he tells her. At the Count de Chandon's party, the Count is very disappointed when he hears that Christine was made into Carlotta's costume girl rather than being given proper singing lessons as he'd wanted. Nevertheless, the contest begins, and Carlotta insists that all the songs be about Paris. She sings a brief song that shows off her ability to do trills. Then the Count suggests that Christine sing. Carlotta protests, as Christine is just her costume girl, but the Count insists that he's heard Christine sing and she has a lovely voice. Timidly, Christine begins to sing "Melodie de Paris." She does well, but it is a simple song and she's a bit nervous. The Phantom is standing at the window of the bistro leading her, but when she finishes the first verse he realizes she needs a little bit of help, and risks entering the bistro himself. Carlotta tells Christine she has a sweet, but weak voice. Time seems to stand still for a moment as the Phantom enters the bistro and sings, just for Christine. Knowing he's there, she suddenly gains courage, and bursts into a set of trills and a much more enthusiastic and beautiful verse of the song. Lead by the Phantom, her voice soars through the bistro like an angel's, capturing everyone's attention and admiration, and inciting great jealousy in Carlotta. When her song is done, Cholet signs a contract with Christine to have her sing in the opera right then and there. Carlotta, furious, hides her envy by pretending to be so delighted with Christine's performance that she wants Christine to have the lead role of Titania in the upcoming production of "The Fairy Queen". Everyone is a bit shocked by this announcement, especially Christine, who isn't sure she's ready for such a huge role. But Carlotta insists that Christine's voice is so beautiful that she should only sing leading roles. The Count de Chandon walks with Christine through the streets of Paris. He is utterly infatuated with her, and her consistent humility and uncertainty of her own talent only adds to her charms. He tells her he is in love with her, but Christine is so overwhelmed with the huge role being offered to her and the Count's adoration that she has difficulty really responding to him. He walks off with her, and the Phantom appears, sad because Christine and the count look like lovers. Carlotta has a plan to ruin Christine. She cooks up a potion and brings it to Christine's room just hours before her debut on the stage as the Fairy Queen. Christine is very nervous, and Carlotta pretends to drink from the glass herself, then tells Christine it's something all opera stars drink before going on stage, to improve their voices. Christine is a little unsure, but Carlotta seems so earnest that she drinks it. When the curtain rises and "The Fairy Queen" begins, the Phantom himself is conducting the orchestra. Christine looks beautiful, and begins to sing her aria, but her voice chokes up strangely. She tries again, and hits several wrong notes before falling to the ground in a fit of coughing. Carlotta begins to laugh triumphantly as the audience boos and the stage erupts in chaos. The Phantom silences the orchestra and jumps onto the stage, furious that his precious Christine is being humiliated. The officers and other actors attempt to apprehend him, but he fights them all off and makes his way to Christine. He then pulls out a gun and shoots at some of the officers, then shoots the rope that holds the giant chandelier over the stage. The chandelier comes crashing down, and in the confusion the Phantom whisks Christine back to her chambers. In her chambers, the Phantom is trying to figure out what went wrong. He sees the glass left on the table, picks it up and sniffs it suspiciously. He asks Christine if she drank it, and she says yes, Carlotta gave it to her. The Count de Chandon appears knocking at the door and calling Christine's name. It has become too much for Christine, and she faints. The Phantom gathers her in his arms and carries her through a secret sliding panel down into his own domain. By the time the count breaks into the room, they are both gone. The Phantom puts the unconscious Christine on a gondola, poling across the underground lagoon of his lair, and promises that he will keep her safe — no one will ever hurt her again. He cannot imagine what life would be like without her. When he docks, some of his ghosts / phantoms carry Christine to a beautiful bed that the Phantom seems to have prepared for her ahead of time. Nearby is a life-size portrait of a woman who looks uncannily like Christine. The Phantom kisses Christine's forehead gently. Carriere appears, having guessed what happened, and tells the Phantom that he must give Christine back. The Phantom replies that there is no way he's sending Christine back to a world that is such hell. His entire purpose for existing was to meet Christine, and now he lives solely for avenging her humiliation. He tells Carriere to leave and never return, as he has Christine now and doesn't need anyone else. Carriere leaves, and the Phantom dons his most ferocious mask, with murder in his eyes. He is going to repay Carlotta for what she has done. As soon as the Phantom leaves, Carriere returns. Christine has awakened, and Carriere tells her she is in great danger and must leave with him immediately. He explains that the Phantom's real name is Erik, a man with a "face like death" who has lived his entire life underground, wearing a mask to hide his monstrous features. Christine wants to know how he knows all of this, and Carriere admits that he is the Phantom's father. He points out the portrait, and explains that the woman in the portrait is Belladova, the Phantom's mother. Belladova was a singer, with a glorious voice, and the Phantom is in love with Christine because her voice reminds him of his mother's. A flashback scene plays as Carriere tells his story. He fell in love with Belladova, a dancer in the opera with a beautiful voice. She became pregnant and wanted to marry him, but he was already married. When she discovered this, she went completely mad, praying desperately to Saint Mary, even purchasing herbs from a gypsy to try and end the pregnancy. But Carriere stopped her from taking all of the herbs, and instead cared for her in the underground levels of the opera house until she gave birth. The child was born hideously deformed, a mockery of their relationship. But by then, Belladova was so crazy that she somehow believed that Erik's face was beautiful. When Erik was still a young child, Belladova died, and Carriere looked after him as his guardian, raising him in the basement beneath the opera house. One day, the young boy was playing near the underground lagoon and caught a glimpse of his own reflection in the water. He was terrified, and then heartbroken, when he realized that monster's face was his own. Carriere gave him a mask to cover his face, and Erik began to pray to Saint Mary himself just has his mother had. But it seemed that Saint Mary never answered his prayers, for his face remained deformed and horrifying, and Erik grew up knowing only the darkness and loneliness of the opera's basement. Carriere admits that he has never told Erik he was his father. He says he knows that one day he will have to abandon Erik, and didn't want to hurt him with the knowledge that his own father couldn't stay by his side. Carriere tells Christine that she must abandon Erik as well, as he is beyond help and doesn't understand her world. Christine refuses, saying that she is not afraid, she knows the Phantom's heart, and will not leave until she is able to speak to him again. Carriere leaves, but warns her that there's more to the Phantom than what Christine believes, and she should get away as soon as she can. Meanwhile, the Phantom appears to Carlotta, pretending to be an admirer. He presents her with a bouquet of dead roses, and suddenly his sinister intent becomes all too clear. Carlotta screams and tries to flee. The Phantom tells her that the opera belongs to him, not to her, and that this is punishment for what she did to Christine. He pulls out a sword and slashes her with it. When he returns to Christine in his domain, he greets her as if nothing happened. He suggests they go for a picnic in the "forest" (an elaborate set of cast-off stage props, complete with bird chirping sound effects), and brings with him a book of poetry by William Blake that once belonged to his mother. He tells Christine that now that she is with him he has never been happier in his life. Christine feels she is growing to love him, and asks him to let her see his face. At first he refuses, saying it's the one thing he cannot do for her and she should not ask him again. But she persists, gently. She says that if love for him could allow his mother to find beauty in his face, then she should be able to do the same. She sings so sweetly and affectionately that it wins him over, and shyly, fearfully, he removes his mask. Christine's expression slowly darkens into one of terror. Perhaps Carriere had been right, and it was not Belladova's love for her child, but rather her madness, that allowed her to see Erik's disfigured face as beautiful. Christine, no matter how much she cares for the Phantom, cannot bear the sight of his face, which is more horrifying than anything she had imagined. She backs away screaming, and runs off. The Phantom is devastated. Christine had brought him hope, hope that perhaps she was the one he'd been waiting for, who could love him the way his mother had. That hope was gone. And the Phantom declares that he loves Christine so much, he cannot bear for anyone else to have her. If he cannot have her, no one should. The Count de Chandon is mourning in Christine's dressing room. She has disappeared and he has no idea where to look for her. But suddenly she appears behind the mirror of the sliding panel. He is overjoyed but cannot figure out how to get her out of the mirror. He calls for help, and Carriere comes running. Carriere knows how to open the panel and he lets Christine out. Christine tells the count and Carriere what happened. She cannot believe she betrayed Erik's trust the way she did, and wants to go back and make amends, but Carriere senses what's coming and insists that the count get Christine out of the building at once. He warns the police to clear the building, and a lone policeman remains in Christine's room to stand guard. The Phantom appears and attacks the policeman, taking his gun and threatening some of the troupe actresses with it. He is spotted by the police who chase him and shoot at him. He is wounded, but still manages to escape. The police search for him, and when Carriere overhears them commenting on the Phantom's blood on the floor, he knows where Erik is hiding. He sends the police off and pulls Erik from his hiding place behind some props. Erik is badly wounded, too weak to make it back to his domain without help. As they wait for the coast to clear, they talk together. Erik is dying, they both know it, and Carriere finally tells him that he is his father. Erik replies that he already knew, but was waiting for Carriere to say so. He asks his father to promise that he won't allow his body to be put on display as a freak show somewhere. Carriere promises. When it seems safe, they both make their move to escape, but the count appears with Christine and the Phantom forgets all about trying to escape. He heads for Christine, and attacks the count who is trying to stop him. He is about to stab the count with a knife when Christine calls out "Erik!" He looks back at her, then drops the knife and punches the count instead of killing him. They struggle, and eventually the count gets away. Officers arrive and throw ropes around the Phantom. The chief of police orders his men not to shoot so that they can take the Phantom alive. This is Erik's worst fear, that he will be put on display for people to gawk at, and he turns to his father for help. Carriere knows what Erik wants, and he grabs a policeman's gun, aiming it at the Phantom. But he hesitates. He's not sure he can bring himself to shoot his own son. Erik begs him, and Carriere closes his eyes and fires the gun. It's a good hit, and the Phantom falls, calling for Christine. Christine runs to him, and Carriere gets the policemen to leave. Christine cries, and sings "You are music" to the dying Phantom. She gently removes his mask, and kisses his deathlike face. She replaces the mask, and the Phantom whispers her name once more before he dies in her arms. The Phantom is placed on his own gondola, and his ghosts, the officers, the members of the opera troupe, the count, Carriere and Christine all watch as the gondola slowly floats away across the lagoon. Christine is mourning alone, when she hears the Phantom singing behind her. She turns to see him, wearing a white cape and mask, singing a sort of farewell to her. She runs to him and he embraces her, and they sing together before the curtain falls. Phantom was first performed by Cosmos Troupe in 2004, revived by Flower Troupe in 2006, and revived again by Flower Troupe in 2011. Final performance for Hinata Haruki and Yumi Serina. † Souno Haruto was announced absent due to illness from Jan. 30th - Feb. 4th.. Understudies listed above. Created by lokai. Last Modification: Monday 25 of February, 2019 05:09:47 PST by caithion.